Were you injured after falling from an elevated height? We’ll get you the compensation you deserve. 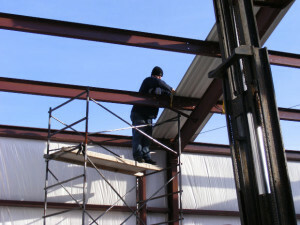 Construction workers must often work in very unsafe conditions, such as working at elevated heights from a roof, scaffolding, bridge, or elevator shaft. Accidents can easily occur if the equipment being used is faulty, such as faulty scaffolding or faulty ladders. Injuries can also occur as a result of carelessness on the part of fellow workers, the construction foreman, or the property owner. According to the Atlanta CDC (Centers for Disease Control and Prevention) more construction workers die as a result of falling from elevated heights than from any other job-related injury. Falls account for one-third of work related deaths suffered by construction workers. And almost two-thirds of these falls are from an elevated height such as a ladder, roof, or scaffold. If you or a loved one has suffered injury or wrongful death due to falling from an elevated height such as a roof, ladder, or scaffolding, please contact us at our Atlanta office of the Bennett Law Group. We understand the Georgia laws regulating worker’s compensation benefits, as well as third party claims against a negligent equipment manufacturer, negligent property owner, or other negligent party. Our attorneys will sit down with you free of charge to discuss your situation. We have obtained significant results on behalf of previous clients in handling construction accident cases. Roofs are not always safe to work on, especially if the worker is lifting very heavy items or using power tools. This can create an unsafe condition. Any time work is being done from elevated heights, safety equipment should be used. Guardrails should be in place, and safety ropes, safety harnesses, and other appropriate safety equipment should be used. Making sure that all workers are trained in how to properly use the safety equipment and that they are also trained in how to work safely on ladders, scaffolds, roofs, and other elevated heights. Making it a point to always plan ahead to do the job safely. If you or a family member has suffered injury due to a fall from a height such as a roof, ladder, scaffolding, or other elevated structure and you would like to consult with an attorney, please contact us at the Bennett Law Group. Our construction accident lawyers have over 50 years’ experience in helping construction accident victims in Atlanta and throughout the state of Georgia get the compensation they are entitled to. We will meet with you free of charge and thoroughly review your situation to ascertain exactly what happened, who was to blame, and what compensation you may be entitled to receive. We will do everything possible to ensure that you receive the maximum compensation allowed by law for your injuries, lost wages, pain and suffering, and costs of future medical treatment. Contact us online or give us a call at 404.541.9330. We are here to help in any way we can.